Marie Mbeutcha is from France. In December 2016, she joined the Terahertz-Photonic group led by Prof. Viktor Krozer at Goethe University Frankfurt, as part of the CELTA ITN project. 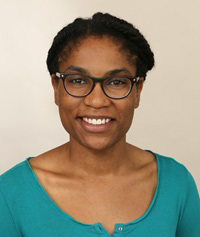 Her research focuses on the development of components and the integration of millimeter-wave imaging radar front-ends, MMIC mixed-signal and mmW circuit design. Marie holds a Master’s degree in Electrical and Optical engineering from Telecom SudParis. During her Master’s studies, she gained experience in signal processing, wireless and optical communications. She completed her Master’s thesis on the “feasibility of a UWB radar for physiological parameters monitoring” at French research institute CEA-Leti. She joined Aalborg University as a visiting researcher, her research interest included massive MIMO channels and beamforming techniques.